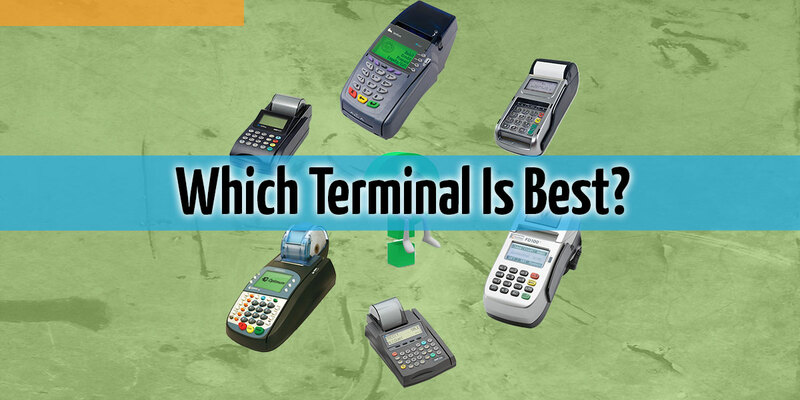 Choosing a credit card terminal can be confusing. Should you go with a Verifone VX510, or maybe a Hypercom T4100? There’s also Ingenico, First Data, Dejavoo, and Nurit models to choose from. Do you want the dual comm or the dial-up connection? What if you want both? How about getting the LE (lite) version or the high memory and “fully equipped” option? There really are way TOO MANY options so let’s simplify things. Below I’ll explore some of the important factors when it comes to using and obtaining a countertop credit card terminal. The information in this article will cover hard wired countertop terminals and we’ll leave wireless and virtual terminals for another time. First off, simply decide what you want the terminal to do. In an ideal world, what would you like the terminal to do for you and your business? That is, what functions do you want it to be able to carry out? Do I plan to attach a check reader or external pinpad to my terminal? Do I plan to accept gift cards on the same terminal that I run credit/debit cards? What type of connection do I have: dial-up connection through an analog phone line or high speed connection through and Ethernet cable? Am I going to use the same terminal for multiple merchant accounts? You can achieve all the functionality and options mentioned above by selecting a simple to use terminal by Verifone. Some terminals have a lot of extra buttons and features that will end up going unused. So naturally that begs the question: Do you want a terminal that has a bunch of buttons you’re never going to use, takes valuable countertop or desk space, and has a built in check reader when you don’t accept checks? Or do you want the simple option that will “cover all your bases” and give you the flexibility that you need at your business? My recommendations are listed at the bottom of this page, but let’s look at a couple other considerations when it comes to selecting a credit card terminal. If you are going to plug your terminal into a phone line instead of an Ethernet cable, remember that all terminals whether made by Verifone, Hypercom or another manufacturer work best when connected to an analog phone line vs. a digital phone line through a cable provider. I’m not saying that they won’t work if you use a digital phone line they are just more reliable when connected to a good old fashion analog line. Yes, splitting the phone line with a fax line is acceptable. If you’re going the Ethernet route, just get a dedicated Ethernet cable and run it to the countertop or desk space where you’re going to set the terminal. Plug in the cable and you’re ready to go. Dial-up approval process usually takes 5-8 seconds where Ethernet connected terminals will approve transactions in 3-5 seconds. In my experience I have rarely, and I do mean rarely, recommended any stand alone credit card terminal other than Verifone models. Both terminals I recommend are certified with First Data processing so be sure to check with your provider before obtaining one. Actually, there are a lot of similarities and both are PCI compliant. The VX570 is just a little bigger as you can see from the picture and it has more memory. It’s kind of like buying a car that offers V6 and a V8 option. The VX570 is the V8 option. The VX510 is used in nearly every other situation. Both of these terminals can be used in retail merchant account setting or a mail/phone order setting. There is NO power switch on either of these terminals. In fact, most desktop and counter top credit card terminals do not have a power switch. In order to turn the terminal off, you simply unplug it. This is also a great way to reboot the machine if there is ever an error on the screen. Once these terminals are programmed with your merchant number and bank account information, unplugging it does NOT require you to reprogram it. With that in mind, you should try to keep the number of resets to a minimum but move it if you need to. In short it means high-speed capable. A dual comm terminal will have the capability of processing transaction with a high-speed connection through the use of an Ethernet cable and at the same time can be programmed to use an analog phone line connection if the Ethernet connection fails. It’s a back up measure. Additionally, if you have a dual comm terminal you can use it only as a dial-up connection if you choose. Both the Verifone VX510 and the Verifone VX570 come in dual comm models. Most terminals on the market today will have thermal printers. Both of the Verifone terminals that I recommend use a thermal printer which means that you will never have to replace a printer ribbon. This cuts down on operating costs. If you’ve answered the questions from above, you should have a good idea which terminal is for you. Now you just need to decide how you will obtain the terminal. I suggest staying away from terminal leases. The best option for acquiring a countertop terminal is to use a terminal placement program. This will give you flexibility of upgrading your terminal at any point should it ever become outdated. Additionally, the terminal placement program is a reasonable flat monthly fee and a month-to-month contract. So remember, when choosing a credit card terminal, less is usually more. Remember the terminal guidelines and just pick a terminal that will do what you want it to. Leave the fancy terminals with all the bells and whistles to someone else.